Predictably enough our (yes 'our,' I'm totally part of the team) first game was a disappointment. Though Lescott scored first off his massive forehead, France were able to pull it back shortly after with a cracking shot from Nasri. 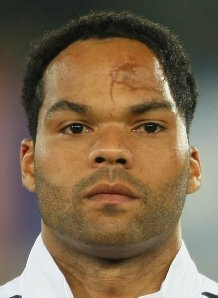 Look at Lescott's Forehead. What's going on there? England then did their usual thing of playing defensively in their half and just passing around. It makes for boring football. My dad reckons it's better to keep the ball than lose it, even if it's just being passed around whereas I shout 'GET FORWARD GET A GOAL.' The problem with trying to hold the ball is that England lose possession so easily and, because it's in their own half, leave themselves open to an easy goal. When they do lose possession my grandad says 'You bloody idiot' like a disappointed parent. I think part of England's constant disappointment is that we build them up to be so much. ITV, one of the main channels in the UK is currently running adverts where they have rewritten England's previous tournament losses to make England win! So, Gareth Southgate's infamous penalty miss against Germany in Euro '96 is modified so he scores and England win. It doesn't help that our newspapers and news programs also hail the players as 'heroes' and 'lions' (from the team nickname 'Three Lions'). It's easy to see how that could boost an ego and make the team think they are better than they are. These are the same newspapers that vilify a player like Ashley Cole, however, when he shot at Chelsea youth team players with an air rifle at training and rightly so. It's rather hypocritical then for him to be an English 'hero' come tournament time. It's a tired argument and I'm loath to use it but you can't really equate football players with members of the Armed Forces around the world. Of course, there are genuine talents in the squad, Wayne Rooney for example, but there just aren't enough to make the England team consistently good enough to win a tournament. Having said that, when Lescott scored the first goal I was off my seat shouting and cheering. If they win the tournament, I always knew they would win the tournament. I should have said that this is for the Euro 2012 tournament currently gripping Europe by the balls, distracting us while the Eurozone implodes and Germany slyly build their empire.